It’s time to start putting in some winter base miles! 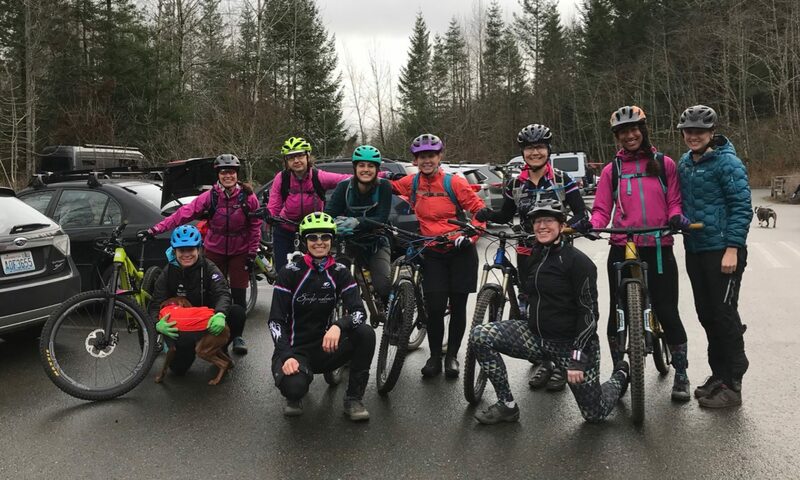 The Pacific Northwest’s rainy climate makes it possible to ride year round, but the constant rain and gray can be tough. Be smart so you can get fit without burning out! Here are the results from a team conversation about the best/silliest/most fun ways to get ready for the spring race season. For tips from a true pro, check out Jess Cutler’s winter training tips. Don’t just check the weather forecast; check the Doppler radar and wind directions, as you may be able to avoid rain by seeing which direction the weather moves. If you’re going over any big hills, check the freezing level so you don’t hit ice or snow! Go with the sunbreaks and ride when it’s not pouring rain. Mountain bike, trail run, or ski when it is raining! I’m serious, though: It’s a delicate balance of training through crappy weather and burning all your mental matches too early. If you can balance it so that you are training enough and also not suffering too much, that is key. Otherwise you will probably burn out when it keeps raining through July. If you can find other activities to get out of the rain now and again, it really helps. Plus snow is brighter and less dreary than cold rain. Set your goals for later in the season. We have a lot of races here, and you don’t have to be in shape for the early March training races. 3. Get the right equipment. To keep your feet warm, and maybe a little dry, layer up on booties (use at least 2), and little hotties (toe wamers) on your shoes, under your booties. Of course, aren’t we all “little hotties”? Take extra tubes with you, as flats may be more likely. Plastic Baggies are excellent rescue devices for cold feet. Place them (trimmed if possible) over your socks inside your shoes. Investing in a quality raincoat is a must. Use full fenders with a buddy flap for your buddies!! You can buy a buddy flap, or just make one with a piece of a yogurt container and some duct tape. Keeping your core and hands warm is extremely important. I recommend wool base layers, especially in the rain because they stay warm even when wet. For the hands, on a cold rainy day glacier gloves are a must. They are inexpensive and available at Peterson Bicycle! Good bike lights help you be seen when it’s dark out. 4. Be creative with indoor training…or go on vacation. Plan a trip to drier weather! Albuquerque, here I come! I like to work out to old Billy Blanks Tae Bo or play some Kinect (Dance Central, Zumba, Kinect Sports…). Come cross train with me sometime! Oh, and ice hockey is fun, too. We have conflicting feelings about indoor riding: (1) Avoid the trainer at all costs (normally I’m ok with the trainer, but this year I’ve had trouble because I keep getting distracted by my flooding basement. Every time I go to ride the trainer, I have to deal with that instead…) (2) If you get stuck with your motivation, try riding the trainer every day, even if it’s just for 10 minutes. If you do enough indoor riding you’ll eventually go stir crazy and feel ready to get outside. (3) get rollers because they improve your handling and cadence. (4) ride the trainer and rent all the movies you didn’t get to see during the year and watch them on the trainer. Preferably with good soundtracks. Action movies are more exciting when your heart rate is up. Go to the rock gym, yoga class, or lift weights to build core and upper body strength. Solid fitness in your core can go a long way on the bike. 5. Sometimes, you just have to ride in the rain. If you do end up out on a miserable rainy day, avoid stopping unless absolutely necessary. If you let your body temp drop too much it can be very difficult to get it back up. Put warm water in my water bottles. I drink more that way. Add Bailey’s to the hot chocolate! Soak in the bath after a cold ride to regain feeling in your limbs. If you’re going to ride in the rain, ride with a friend. 🙂 It’s no fun to suffer alone. Ride in the rain so much that you burn out.